Providence decided to throw a “nuclear” bomb on the enemies of the Church. The havoc wreaked in Hiroshima and Nagasaki is only a minor fever compared to this bomb. The “nuclear bomb” of Catholicism has been ready to explode for two centuries now. When it does, we will understand the full meaning of the expression from Scripture, “Non est qui se abscondat a calore ejus” [no one can escape its heat]. This bomb has a very sweet name: It is called the Treatise on True Devotion to the Blessed Virgin. In it, every word, every letter is a treasure. It is the book of the new times that are coming. Eighteenth century painting kept in the Hospital of the Daughters of Wisdom in Rennes, France. In his work, Saint Louis Grignion de Montfort expounds in what perfect slavery of the faithful to Our Lady consists. He shows the fundamental role of the Mother of God in the Mystical Body of Christ and in the spiritual life of every Christian. He teaches us to live our spiritual life in consonance with these truths. And he sets us in motion on the most sweet and absolutely marvelous and perfect path to unite us with the Blessed Mother so completely, as no piece of Christian literature has ever done. By uniting the world to Our Lady, Saint Louis Grignion de Montfort says, this devotion will unite it with God. The day when men know, appreciate and live this devotion, Our Lady will reign in all hearts and the face of the earth will be renewed. How? 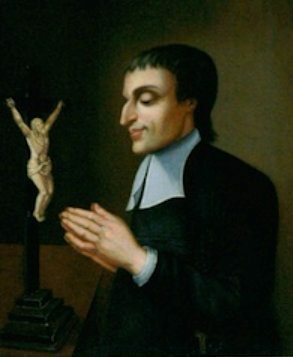 Saint Louis Grignion de Montfort clarified that his book would give rise to unrelenting opposition, would be calumniated, hidden and denied; that his doctrine would be defamed, covered up and persecuted; that it would automatically cause profound hostility in those who do not have the spirit of the Church. But that one day would come when men would finally understand his work. On that day chosen by God, the restoration of the Kingdom of Christ would be assured. We repeat: this True Devotion is the real nuclear bomb which does not destroy but resurrects; the bomb that God has placed into the hands of the Church, foreseeing the bitter events of this century. We confide incomparably more in Saint Louis Grignion de Montfort’s “nuclear” bomb and its power, than we fear the devastating action of all human forces. The preceding article was written by Plinio Correa de Oliveira and originally published in The Legionário, no. 689, on October 21, 1945. It has been translated and adapted for publication without his revision. –Ed. This entry was posted in Uncategorized by Plinio Corrêa de Oliveira. Bookmark the permalink.